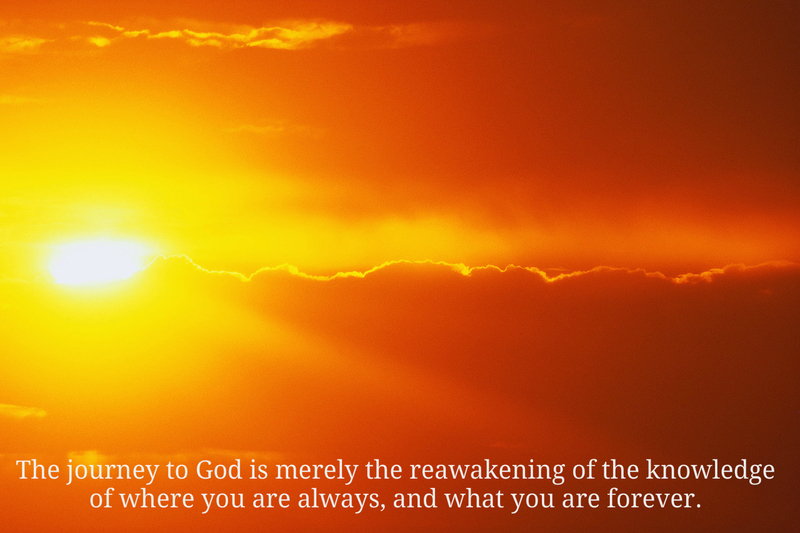 “You are at home in God, dreaming of exile but perfectly capable of awakening to reality. Are you afraid to find a loss of self in finding God? “Would you be hostage to the ego or host to God? You will accept only whom you invite. 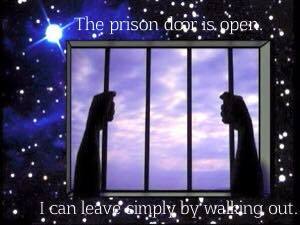 You are free to determine who shall be your guest, and how long he shall remain with you. For all your pain comes simply from a futile search for what you want, insisting where it must be found. This question should be asked a thousand times a day, till certainty has ended doubting and established peace. “Remember how many times you thought you knew all the ‘facts’ you needed for judgment, and how wrong you were! Is there anyone who has not had this experience? Would you know how many times you merely thought you were right, without ever realizing you were wrong?” (M.10.4:1,2,3). “How long, O Son of God, will you maintain the game of sin? Shall we not put away these sharp-edged children’s toys? How soon will you be ready to come home? Perhaps today? There is no sin. Creation is unchanged. “How willing are you to forgive your brother? How much do you desire peace instead of endless strife and misery and pain? WHAT ARE SOME OF THE COURSE’S PRINCIPAL MESSAGES? “The course is simple. It has one function and one goal. Death cannot come from life. Ideas remain united to their source. They can extend all that their source contains. In that, they can go far beyond themselves. But they can not give birth to what was never given them. As they are made, so will their making be. As they were born, so will they then give birth. And where they come from, there will they return…. I walk with God in perfect holiness. “A universal theology is impossible, but a universal experience is not only possible but necessary. “Your task is not to seek for love, but merely to seek and find all of the barriers within yourself that you have built against it. It is not necessary to seek for what is true, but it is necessary to seek for what is false.” (T-16.IV.6:1-2). “This course is easy just because it makes no compromise. 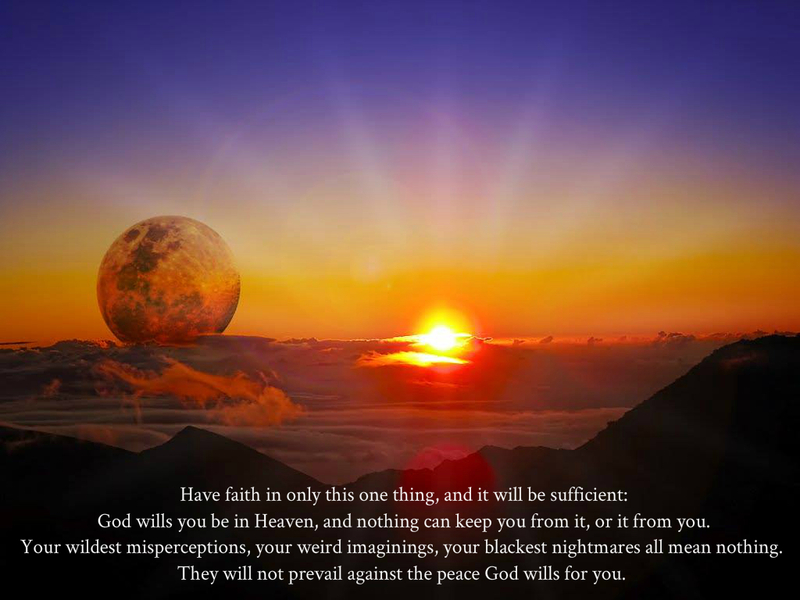 “There is no order of difficulty in miracles. One is not “harder” or “bigger” than another. 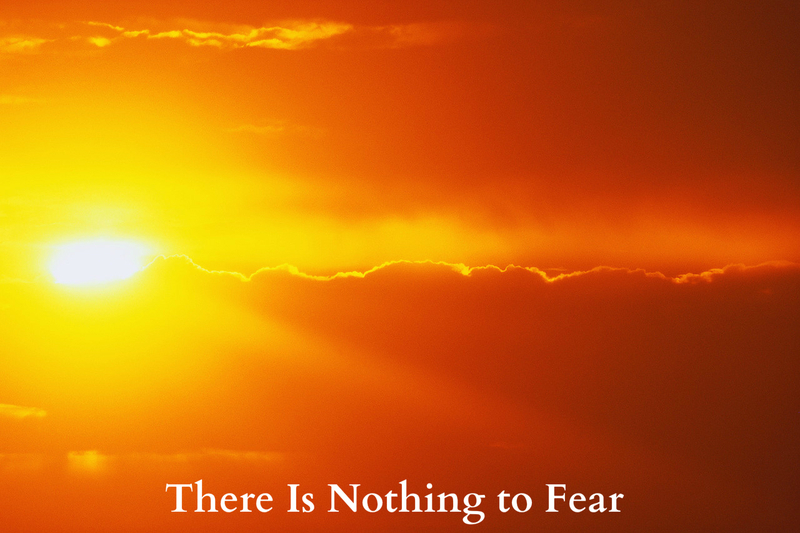 The undoing of fear is an essential part of the Atonement value of miracles (T-1.I.26). Those who seek the Light are merely covering their eyes. The Light is in them now. “You are the work of God, and His work is wholly lovable and wholly loving. “God knows His children with perfect certainty. He created them by knowing them. 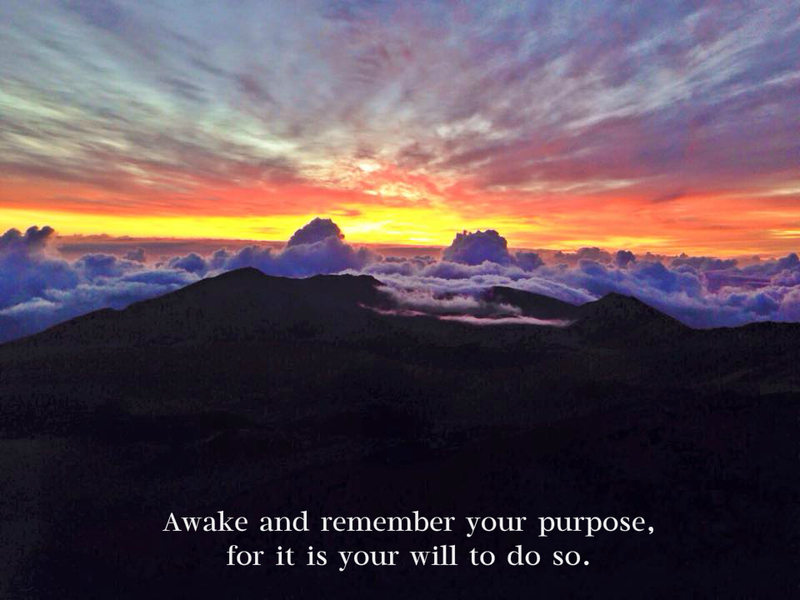 “Glory be to God in the highest and to you because He has so willed it. Ask and it shall be give you because it has already been given. 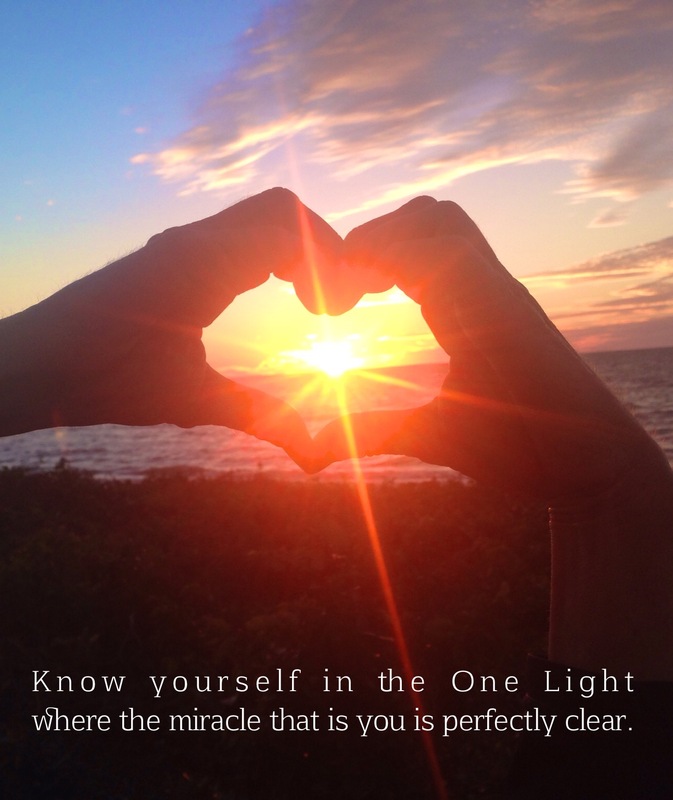 Ask for light and learn that you are light. who knows of light and can therefore teach it to you. “Nothing and everything cannot coexist. To believe in one is to deny the other. Fear is really nothing and love is everything. “Judgment and love are opposites. From one comes all the sorrows of the world. From the other comes the peace of God. What is the ego? Nothingness, but in a form that seems like something. In a world of form the ego cannot be denied for it alone seems real. Yet could God’s Son as He created him abide in form or in a world of form? Who asks you to define the ego and explain how it arose can be but he who thinks it real, and seeks by definition to ensure that its illusive nature is concealed behind the words that seem to make it so. There is no definition for a lie that serves to make it true. Nor can there be a truth that lies conceal effectively. The ego’s unreality is not denied by words nor is its meaning clear because its nature seems to have a form. Who can define the undefinable? And yet there is an answer even here. We cannot really make a definition for what the ego is, but we can say what it is not. And this is shown to us with perfect clarity. It is from this that we deduce all that the ego is. Look at its opposite and you can see the only answer that is meaningful. 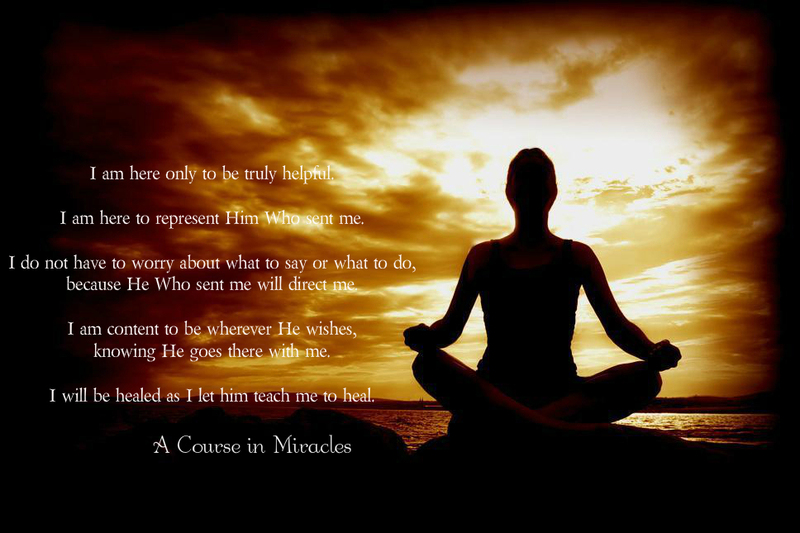 The ego’s opposite in every way,–in origin, effect and consequence–we call a miracle. And here we find all that is not the ego in this world. Here is the ego’s opposite and here alone we look on what the ego was, for here we see all that it seemed to do, and cause and its effects must still be one. Where there was darkness now we see the light. What is the ego? What the darkness was. Where is the ego? Where the darkness was. What is it now and where can it be found? Nothing and nowhere. Now the light has come: Its opposite has gone without a trace. Where evil was there now is holiness. What is the ego? What the evil was. Where is the ego? In an evil dream that but seemed real while you were dreaming it. Where there was crucifixion stands God’s Son. What is the ego? Who has need to ask? Where is the ego? Who has need to seek for an illusion now that dreams are gone? “The Voice of the Holy Spirit does not command, because It is incapable of arrogance. It does not demand, because It does not seek control. It does not overcome, because It does not attack. It merely reminds. It is compelling only because of what It reminds you of. It brings to your mind the other way, remaining quiet even in the midst of the turmoil you may make” (T.5.II.7.1,2,3,4,5,6). “The world has never been at all. “Forget not the Kingdom of God for anything the world has to offer. but it can blind the Sons to the Father if they behold it. You cannot behold the world and know God. “Forgiveness recognizes what you thought your brother did to you has not occurred. It does not pardon sins and make them real. It sees there was no sin. And in that view are all your sins forgiven. What is sin, except a false idea about God’s Son? Forgiveness merely sees its falsity, and therefore lets it go. What then is free to take its place is now the Will of God. Forgiveness is still, and quietly does nothing. It offends no aspect of reality, nor seeks to twist it to appearances it likes. It merely looks, and waits, and judges not. He who would not forgive must judge, for he must justify his failure to forgive. But he who would forgive himself must learn to welcome truth exactly as it is. “The name of Jesus is the name of one who was a man but saw the face of Christ in all his brothers and remembered God. “There is nothing about me that you cannot attain. “If you want to be like me I will help you, knowing that we are alike. If you want to be different, I will wait until you change your mind. “When I [Jesus] said, “I am with you always,” I meant it literally. I am not absent to anyone in any situation. Because I am always with you, you are the way and the truth and the light. You did not make this power, any more than I did. belonging to anyone at the expense of another. It is but your thoughts that bring you fear. We only start again an ancient journey long ago begun that but seems new. We have begun again upon a road we travelled on before and lost our way a little while. “When you are afraid of anything, you are acknowledging its power to hurt you. 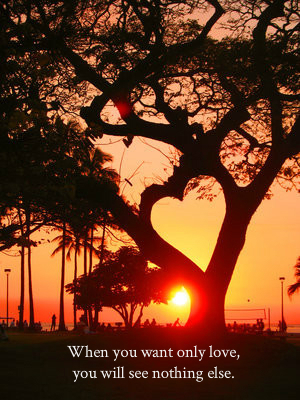 Remember that where your heart is, there is your treasure also. You believe in what you value. “Before you choose to do anything, ask me if your choice is in accord with mine. “Heaven is not a place or a condition. “Illness is some form of external searching. “Prayer is a way of asking for something. It is the medium of miracles. 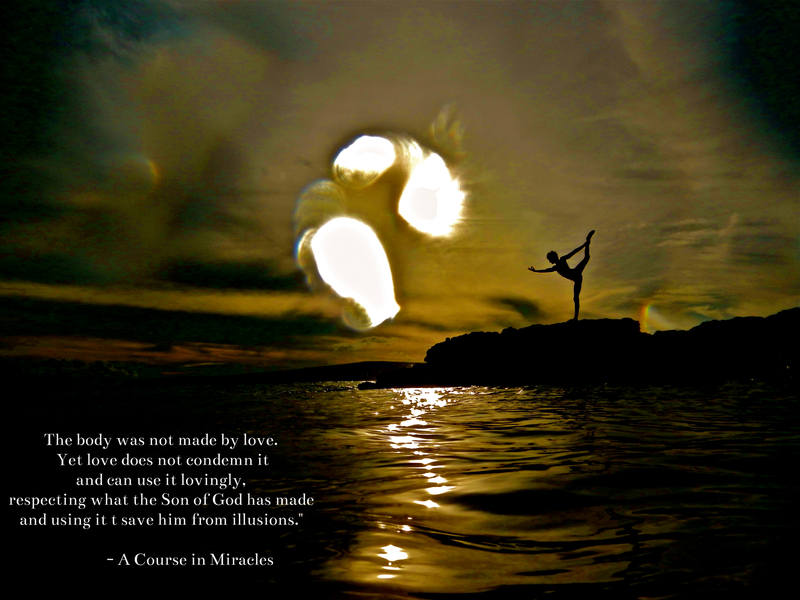 “The body was not made by love. Spirit is already perfect and therefore does not require correction. “Few appreciate the real power of the mind, and no one remains fully aware of it all the time. However, if you hope to spare yourself from fear there are some things you must realize, and realize fully. The mind is very powerful, and never loses its creative force. Every instant it is creating. It is hard to recognize that thought and belief combine into a power surge that can literally move mountains. but that is not the real reason you not believe it. There are no idle thoughts. “Perfect love casts out fear. “A teacher of God is anyone who chooses to be one. His qualifications consist solely in this; somehow, somewhere he has made a deliberate choice in which he did not see his interests as apart from someone else’s” (M.1.1:2). Is it your decision to do so? “Tolerance for pain may be high, but it is not without limit. Eventually everyone begins to recognize, however dimly, that there must be a better way. As this recognition becomes more firmly established, it becomes a turning point. This ultimately reawakens spiritual vision, simultaneously weakening the investment in physical sight. The alternating investment in the two levels of perception is usually experienced as conflict, which can become very acute. “Listen-perhaps you catch a hint of an ancient state not quite forgotten; dim, perhaps, and yet not altogether unfamiliar, like a song whose name is long forgotten; and the circumstances in which you heard completely unremembered. Not the whole song has stayed with you, but just a little wisp of melody, attached not to a person or a place or anything particular. But you remember, from just this little part, how lovely was the song, how wonderful the setting where you heard it, and how you loved those who were there and listened with you. “Oneness is simply the idea God is. And in His Being, He encompasses all things. No mind holds anything but Him. We say “God is,” and then we cease to speak, for in that knowledge words are meaningless. There are no lips to speak them, and no part of mind sufficiently distinct to feel that it is now aware of something not itself. It has united with its Source. And like its Source Itself, it merely is. “Where there is love, your brother must give it to you because of what it is. God gave His Teacher to replace the one you made, not to conflict with it. And what He would replace has been replaced. Time lasted but an instant in your mind, with no effect upon eternity. And so is all time passed, and everything exactly as it was before the way to nothingness was made. The tiny tick of time in which the first mistake was made, and all of them within that one mistake, held also the Correction for that one, and all of them that came within the first. And in that tiny instant time was gone, for that was all it ever was. What God gave answer to is answered and is gone. To you who still believe you live in time and know not it is gone, the Holy Spirit still guides you through the infinitely small and senseless maze you still perceive in time, though it has long since gone. You think you live in what is past. Each thing you look upon you saw but for an instant, long ago, before its unreality gave way to truth. Not one illusion still remains unanswered in your mind. Uncertainty was brought to certainty so long ago that it is hard indeed to hold it to your heart, as if it were before you still. The tiny instant you would keep and make eternal, passed away in Heaven too soon for anything to notice it had come. What disappeared too quickly to affect the simple knowledge of the Son of God can hardly still be there, for you to choose to be your teacher. Only in the past — ”an ancient past, too short to make a world in answer to creation, — did this world appear to rise. So very long ago, for such a tiny interval of time, that not one note in Heaven’s song was missed. Yet in each unforgiving act or thought, in every judgment and in all belief in sin, is that one instant still called back, as if it could be made again in time. You keep an ancient memory before your eyes. And he who lives in memories alone is unaware of where he is. “Seek ye first the Kingdom of Heaven because that is where the laws of God operate truly, and they can operate only truly since they are the laws of Truth. But seek this only because you can find nothing else. God is all in all in a very literal sense. All being is in Him who is all Being. but choose to change your mind about the world. “There is a light in you which cannot die; whose presence is so holy that the world is sanctified because of you. All things that live bring gifts to you, and offer them in gratitude and gladness at your feet. The scent of flowers is their gift to you. The waves bow down before you, and the trees extend their arms to shield you from the heat, and lay their leaves before you on the ground that you may walk in softness, while the wind sinks to a whisper round your holy head. Into eternity, where all is one, there crept a tiny, mad idea, at which the Son of God remembered not to laugh. In his forgetting did the thought become a serious idea, possible of both accomplishment and real effects. 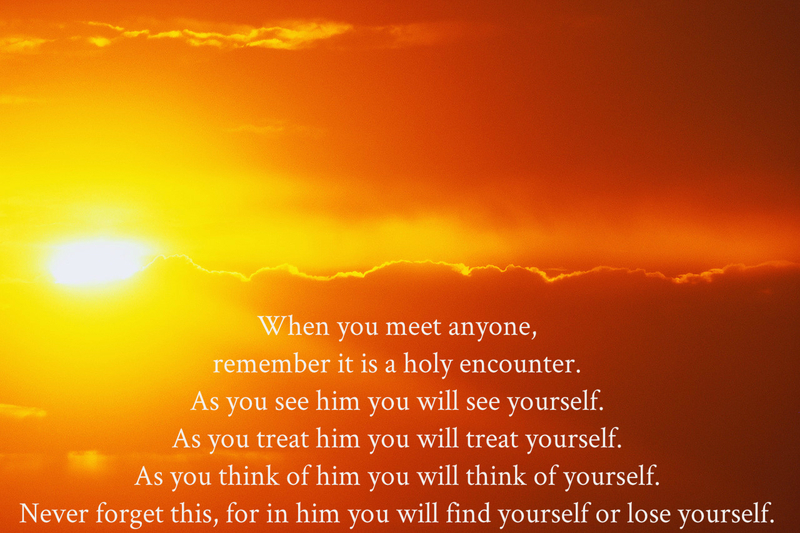 remember it is a holy encounter. “Do not embark on useless journeys, because they are indeed in vain. The ego may desire them, but spirit cannot embark on them because it is forever unwilling to depart from its Foundation. Do not dwell upon it, but dismiss it as accomplished. If you can accept it as your own last useless journey, you are also free to join my resurrection …. The only message of the crucifixion is that you can overcome the cross. What was projected out is seen within, and there forgiveness lets it disappear. For there the altar to the Son is set, and there his Father is remembered. Here are all illusions brought to truth and laid upon the altar. What is seen outside must lie beyond forgiveness, for it seems to be forever sinful. Where is hope while sin is seen as outside? 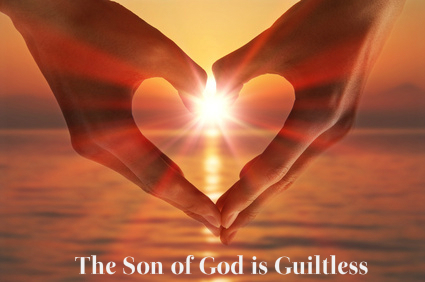 What remedy can guilt expect? But seen within your mind, guilt and forgiveness for an instant lie together, side by side, upon one altar. There at last are sickness and its single remedy joined in one healing brightness. God has come to claim His Own. Forgiveness is complete. shining in the reflection of His Love. In me is His creation sanctified and guaranteed eternal life. and joy established without opposite. I am the holy home of God Himself. I am the Heaven where His Love resides. Choose once again if you would take your place among the saviors of the world, or would remain in hell and hold your brothers there. There is no death because the Son of God is like his Father. Nothing you can do can change Eternal Love. Forget your dreams of sin and guilt, and come with me instead to share the resurrection of God’s Son. And bring with you all those whom He has sent to you to care for as I care for you. 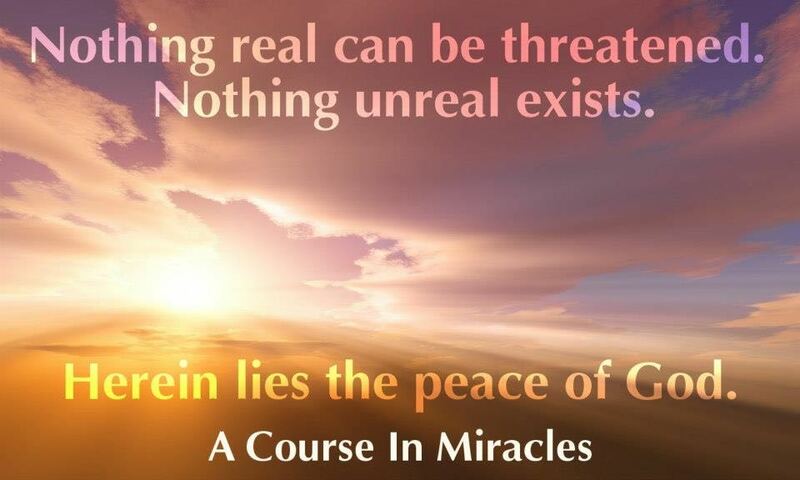 This entry was tagged a course in miracles, acim, all your past except its beauty is gone, atonement, best, body, christ, christian vedanta, course in miracles, cross, crucifixtion, death, ego, famous, god, great, health, heaven, Holy Spirit, I am not a body, idea, illusion, jesus, lord's prayer, love, mind, my only function is the one God gave me, oneness, prayer, quote, quotes, reality, resurrection, smile, syllogisms, the idols of sickness, the journey back, the lessons of the holy spirit, time, true perception, universal theology. Bookmark the permalink.